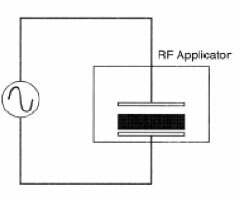 Often the term RF is used to indicate the presence of electromagnetic field or RF energy. RF energy is mainly used in telecommunications, emanated by transmitting antennas or to generate heat in many industrial applications. What is RF Dielectric Heating? In conventional systems the transfer of heat to a body, whether by convection, radiation or conduction, singly or in combination, can only take place through its surface. Consequently the rate at which the internal body of the object heats depends primarily on its thermal conductivity. Heat transfer often has to be restricted in order to avoid damage due to overheating of the surface. 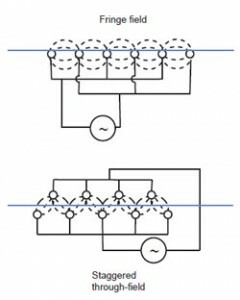 This limit to the temperature gradient between the outside and the inside of a body leads to extended process times, poor equipment utilisation and in some cases batch operations instead of continuous flow. An alternative approach which can eliminate some or all of the problems is dielectric heating, the generic name covering both radio frequency and microwave sectors of the electromagnetic spectrum. Both are widely used by industry because of their so called ‘volumetric’ heat transfer characteristics which avoid the need to heat the surface first. The types of materials and products which can be processed using dielectric heating are basically non-metals which inevitably have poor thermal conductivity. These include food, textiles, paper, ceramics, plastics, pharmaceuticals, chemicals and timber. The principal advantages of dielectric process heating are based on the fact that heat is generated within the substance itself. Some materials notably water, are much more susceptible to this form of heating than are the substrates in which they are held and consequently, preferential heating takes place. This can lead to significant process advantage; for example, a more uniform rate of drying which in turn results in a better quality finished product usually associated with faster production speeds. In non-aqueous systems, such as polymer curing, the internally generated heat reduces process times and improves plant utilisation. Whether dielectric heating is suitable for a given product will depend not only on its loss factor but also to great extent on the product dimensions and shape as well as the way in which the electric field can be applied to it. Dielectric heating arises when a high frequency electric field is established within a material which is a poor electrical conductor. The ease with which electrical energy can be transferred to a body as well as the distribution of that energy, depends on the dielectric properties of the various constituent materials which make up the substance. The main dielectric property of interest is the Loss Factor, which principally determines the amount of energy absorbed by the material for a given electric field. It is important to realise that the dielectric loss factor is not constant but varies with a number of parameters such as frequency, moisture content and temperature. It is possible to find information in the literature giving values of loss factors for certain common materials. However, these are normally measured at ambient temperature and at equilibrium moisture content and should be regarded only as a guide, for a material at a given temperature and moisture content, there is usually a frequency (or resonance) which gives a maximum value of loss factor. For example, water has a maximum dipolar loss factor at about 20GHz. However the loss factor at other frequencies is usually sufficient for an alternative to be satisfactory. The frequencies used for dielectric heating are not chosen because of any relationship with the resonance of water or other molecules but are specified by international regulation in order to minimise the risk of interference with telecommunications. The frequencies available include 13.56, 27.12 and 40.68 MHz in the radio frequency band and are usually referred to as “ISM” bands used exclusively for Industrial, Scientific and Medical applications. Radio frequency dielectric heating will heat water in preference to most substrates with which it is associated. This means not only rapid heating but, in the case of drying, equalisation of moisture content in a product as the wetter areas may absorb more heat than the drier ones. Since energy is transferred by the interaction between the high frequency electric field and the responsive components in the substance, heat is generated throughout the volume of the body. In a RF system, it is possible to design the system so that power is drawn in the proportion to the amount of responsive material in the applicator, hence there is no energy used when the equipment is empty. When carrying out drying, baking or similar operations the energy output will rise and fall proportionally with the quantity of water present in the unit, resulting in high efficiencies. Because it can avoid case hardening and other surface damage because of the volumetric nature of the heating, the quality of a whole range of products, from textiles, to glass fibre, ceramics, polymers wood, paper and food, can be greatly enhanced.